After spending two weeks as counselors at Canadian Adventure, Sal and I spent a week at Mom and Dad’s house in Wisconsin. They weren’t there. I think they were giving a family-living seminar somewhere. Sal and I arrived late the day before and spent this day lazing around the house. I sat out on the deck and tried to get the chipmunks to eat out of my hand. I soon noticed the chipmunks came in two sizes. I checked a field guide and discovered I was looking at two different species. 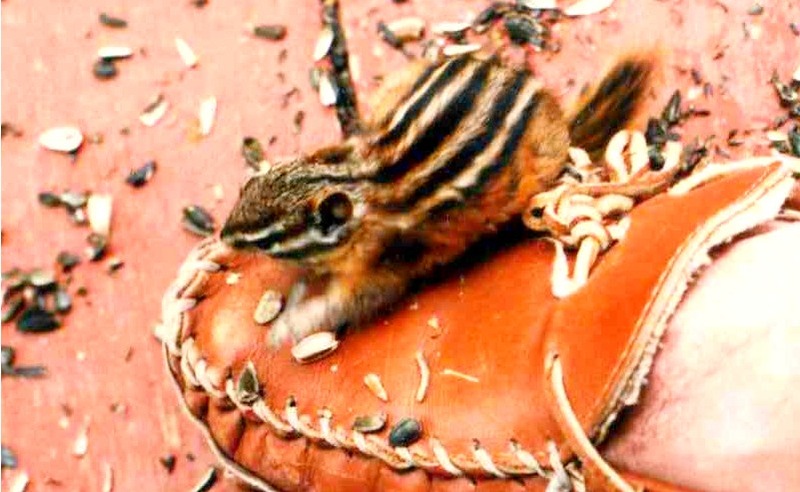 The larger, chubbier ones, with stripes that ended at a reddish rump, were Eastern Chipmunks. The smaller, skinnier ones with stripes that ended at the base of the tail were Least Chipmunks. Both species were foraging for sunflower seeds that had fallen out of the bird feeders. They were on the deck, under the deck and scuffling through the nearby grass and brush. The Red Squirrels would occasionally chase them. During the week, I had some of them take seeds out of my hand as it rested on the deck, but I don’t remember if it was this day that it happened.